Over the years, our Thanksgiving celebration has taken on several different forms. Sometimes it’s a huge extended family celebration, sometimes a small family gathering, and there have even been a few years where I spent the holiday alone. Needless to say, our menu has adjusted accordingly. We have had years where we served both a ham and a turkey and tons of side dishes. Some years when it was just my daughter and I, we had more of a Charlie Brown Thanksgiving with a mishmash of whatever we happened to be in the mood for – sushi, steak, cheesecake. And the years I spent the day on my own, I tended to go with simple single portions – a turkey breast instead of a full bird for example. There do tend to be traditions that hold true year after year though. Something pumpkin flavoured. Cranberry sauce, as my daughter requests it, jellied, from a can, served so that it is still shaped like a can. And candied sweet potatoes – a family tradition for as long as I can remember it. It started out as my grandmother’s sweet potato casserole. For a couple of years, we served a cold version of it as a sweet potato salad. 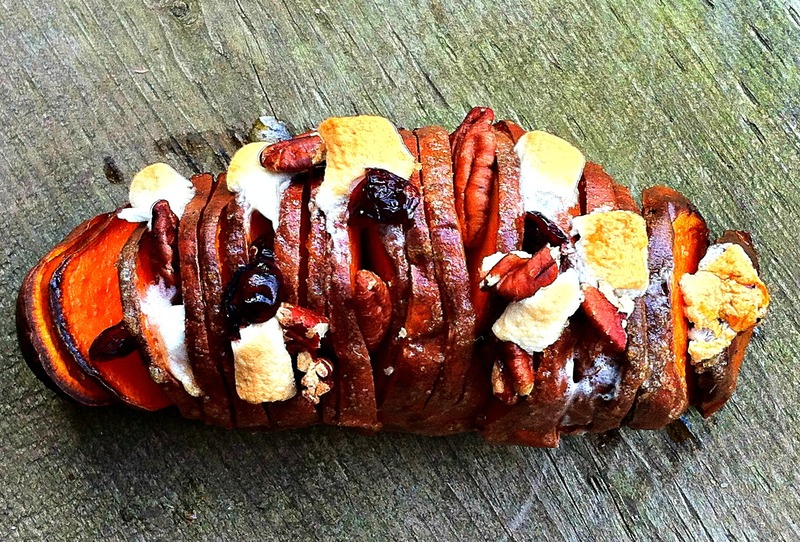 But more recently, it has been served in the form of an individual candied hasselback sweet potato recipe. The advantage of serving it this way is that we can make single individual portions for each person. 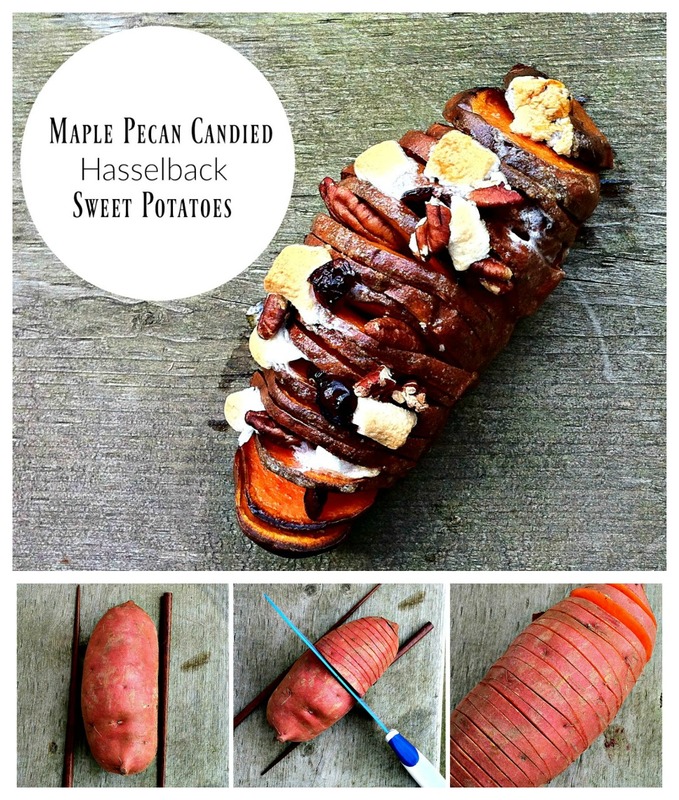 This is an ideal way to still get the delicious flavours of my grandmother’s recipe while making appropriate portions for a smaller group – or when I was making my own little Thanksgiving feast for one, this was a perfect way of not having to deal with the guilt of throwing food away (candied sweet potatoes don’t freeze well). I don’t bother peeling the potatoes. I simply wash them well and dry them. Lay the potato between two chopsticks. This will help you cut the slits in the potato to make it hasselback style but helps prevent you from cutting all the way through. I try to make the slits as even as possible without being too terribly fussy about it. Drizzle the potatoes with a bit of olive oil – I used a pastry brush to spread it a little more evenly. Then sprinkle on a bit of salt. Place in the oven at 400 degrees F for 45 minutes to an hour until thoroughly cooked. Timing will vary according to the size of the potatoes. I like to place them on some non-stick foil or to spray/oil the baking pan so they don’t stick once I add the rest of the ingredients for “candying” them. Remove from the oven. Mix the butter, sugar, and nutmeg together. Stuff this in between the slits of the potato. I found the easiest way to do this was by taking a small bit on the tip of a knife and sticking that down into the potato. It doesn’t really matter if you get every single slit – every third one or so is plenty. Then I took a bit and simply spread it across the top of the potato. Since the sweet potato is hot, the butter starts to melt over the surface of it anyway. 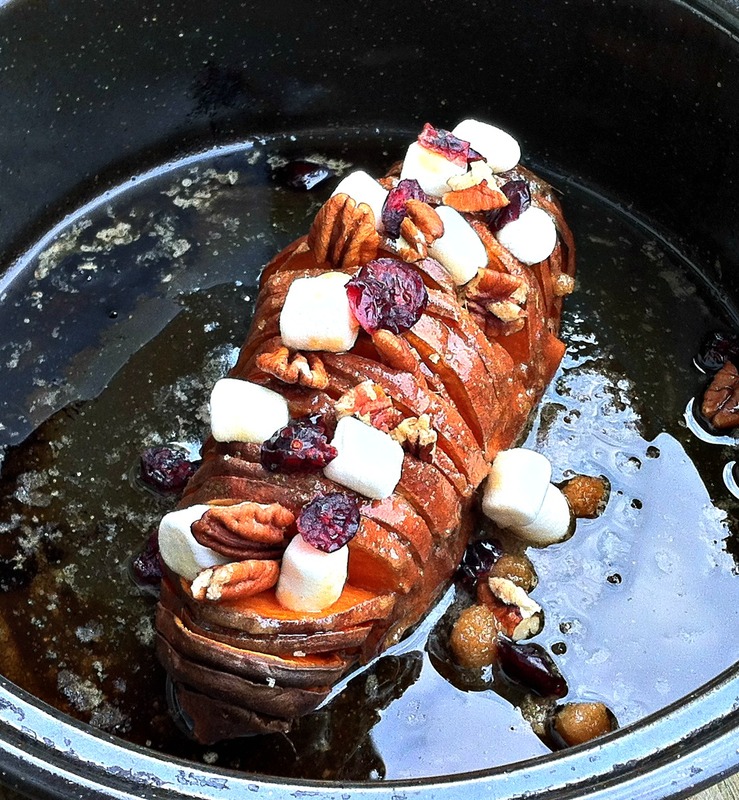 Next, stuff the nuts, cranberries, and marshmallows down into the openings of the potato too. Drizzle a bit of maple syrup over and season with some salt and pepper to finish off the flavours. Pop this back into the oven for 5-10 minutes until the marshmallows are toasted and golden brown. YUM! One bite of this and I’m still transported back to my grandma’s kitchen. I can picture the pretty white dish she served her sweet potato casserole in. I’ll always remember the family stories we shared around the table. In my mind, I can still hear my siblings and I arguing over who was going to help with the cleanup. Isn’t it amazing how one little recipe can make you feel all warm and fuzzy and wrapped up in love? Do you have a traditional dish for Thanksgiving that’s been passed down through your family? If you’re looking for a really delicious main dish recipe to go with these sweet potatoes (that’s not turkey), you’ve got to check out this RED WINE ROSEMARY GARLIC BUTTER RUB MARINATED SIRLOIN TIP ROAST. It’s one of our family favorites!